With all the characters there have been throughout the many Transformers fiction, we (naturally) tend to favor characters who are of the titular race of robots, rather than most of the other beings in this lore. But let's think about some of these "non-Transformer" Transformers characters. Be they humans, aliens, non-TF robots, energy lifeforms, gods, demons, or anything in-between, they just can't be Transformers. So, who are some of your favorites? 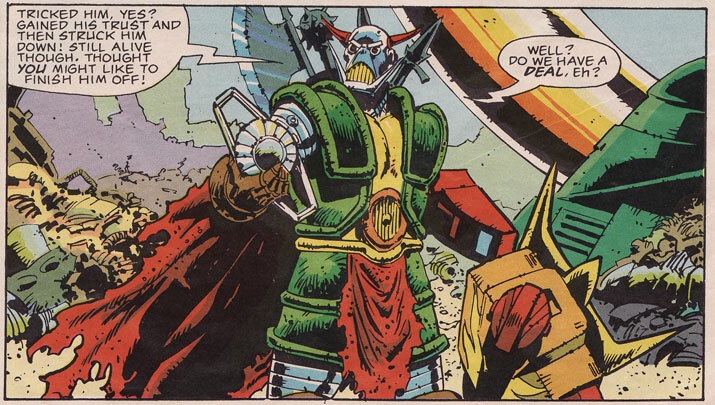 For my pick, I've recently grown quite fond of the Marvel UK character Death's Head. Though he may resemble one, don't ever call him a mercenary/bounty hunter/assassin to his face. Think of him more as... a "freelance peacekeeping agent". He's not evil, nor is he wholesomely good. To him, it's all about profit. He'll do the job for the right price, and will see that his clients stick to their contract... or else. Though, he isn't one to hold a grudge, as revenge "may be satisfying on one level, but it doesn't pay the rent, yes?" Thus, he sees it undignified to kill for free. Though, make him an offer and he will gladly oblige. For him, none of it is personal... it's just business. Mmm... he sorta kinda counts as a TF, even though he's all organic. Sabrblade wrote: Mmm... he sorta kinda counts as a TF, even though he's all organic. Well, they just called his toy that since they couldn't use "Noble/Savage". Though, there do exist four other Transformers like him: The Beast Wars Mutants. They're four bots who each have two Beast Modes but no Robot Modes. forgot these ones, but these ones too! Sari, her dad, and Fanzone from animated as well as the guy that made the headmaster unit and the one that tried to take over the company from Sari's dad. I really like the lines from the headmaster guy where he keeps saying noob haha. The guy that was like cobra commander that turned the TFs into humans in G1. Human alliance figure Master Disaster!!! Hrm... most of these all seem to be humans. Not much love for any aliens or other lifeforms, it seems. cyberwuss wrote: The guy that was like cobra commander that turned the TFs into humans in G1. Old Snake = Cobra Commander.